As I mentioned in the last waffle post I did – I am having a serious love affair with my waffle iron. If you don’t have one, you should go get one. Like yesterday. You can make all kinds of stuff in it! So, tonight I had a hankering’ for some sweet potato hash browns, and what goes good with hash browns? Well, eggs of course. Duh. So, tonight – it was breakfast for dinnertime! 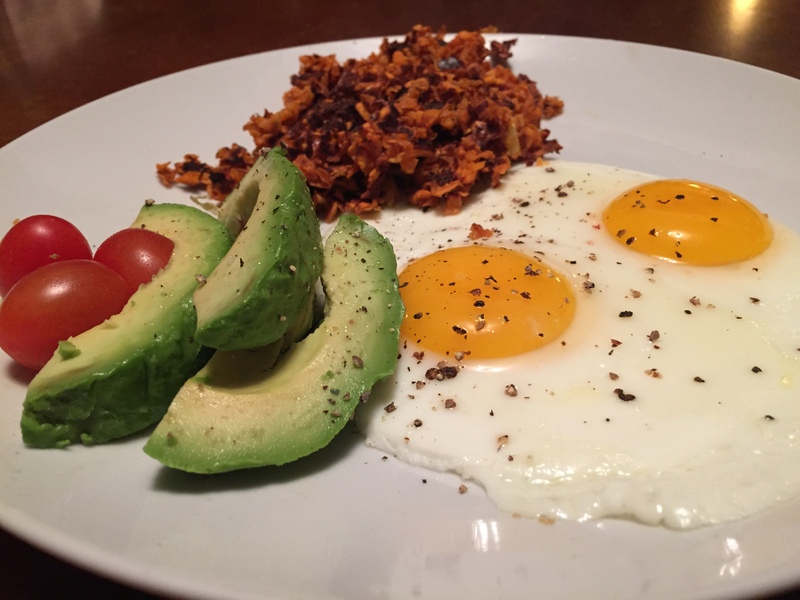 I made a couple of eggs over easy…. I sprayed the pan with coconut oil spray and threw the eggs in to fry once I got the browns in the iron. I also added a side of avocado (one half) and a few cherry tomatoes. Heat the waffle iron to its medium setting.. While it’s heating, you can peel and grate the potatoes, or I threw mine in my food processor skins and all and gave it a couple of chops. Squeeze the grated potatoes in cloth or paper towels to extract as much moisture as possible. Throw them in a bowl, and add cinnamon and grated apples. I also added a bit of pepper to mine. When the iron is hot (ready light comes on), fill the bottom half with 1-2 teaspoons of coconut oil and brush it over the top and bottom irons. I actually have coconut oil cooking spray from Trader Joe’s that will change your life. Go get it. Squeeze the potatoes again to release any excess moisture. Place about 1 cup of potato in the iron, spread it out, and close it. Cook until the hash browns are golden brown and crisp, about eight to ten minutes. Thanks girl!!! It was pretty dang good!!! Anytime! Now I just have to buy a waffle Iron! Lol, I have to wait until I get back home in 4 months. I’m on the road traveling until then. I’m not sure airport security would like me carrying a waffle iron through there. Oh girl!! I’m totally going to check it out! Thanks for sharing girl! Love you and all you do!!!!! !